Miscellaneous. Gouache on board, signed and annotated "The Terriers at GRAF SPEE's heels...". 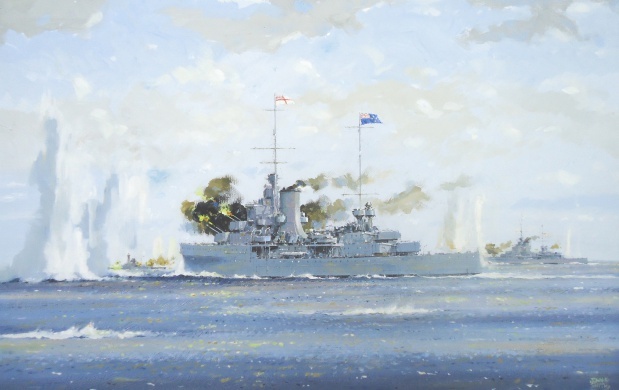 This well known British naval action in the South Atlantic in December 1939 needs little introduction: a fine and dramatic painting of HMNZS ACHILLES and her sister HMS AJAX giving a plucky account of themselves as, together with HMS EXETER, they put up the fight of their lives which eventually spelt the ignominious end of the German battleship. John Stephen Smith (c.1925 - ) is well known on both sides of the Atlantic by publishers who seek an illustrator for book covers and commemorative posters; in UK he has been commissioned by most of the British Railways train companies and shipping lines for poster work.